At Renaissance Watch Repair, we are dedicated to the repair and restoration of vintage and antique pocketwatches. We specialize in the repair of American pocket watches, but we take great pride in bringing any high-quality vintage mechanical (wind-up) watch back to life! We repair many watch brands, including: Elgin, Waltham, Hamilton, Illinois, Ball, Bulova, Howard, Keystone, Longines, Hampden and South Bend. View a more complete list of the brands we repair. With each antique watch we repair, the goal of our expert watchmakers remains the same: To return your vintage watch to its best possible condition. We want your watch to look and work like new, and we fully guarantee our work. We are located in Bellevue, Washington (near Seattle) but we're as close as your mailbox! We conduct business through the Internet and U.S. Mail, and we have a long list of satisfied customers throughout the United States. We are members in good standing of the Washington Watchmakers-Clockmakers Association and the National Association of Watch and Clock Collectors (NAWCC). Our company-founder and head watchmaker is an elected officer of the Washington Watchmakers Association, a founding Board member of the Norwest School of Horology, and has served as a nationally-elected Director of the American Watchmakers-Clockmakers Institute. We hope you'll let our expert watchmakers return your vintage or antique pocketwatch to its best possible condition. We'll help you create a family heirloom that will be treasured for generations! The answers to many common vintage watch questions may be found on our Frequently Asked Questions pages, and we encourage you to look there first. If you are trying to find the age of your antique watch, or are searching for historical information about a particular watch company, please visit the Company Histories and How To sections of our web site. Our web site also offers a wealth of information about vintage pocket watches and the companies that made them. We invite you to explore and learn, and contact us if you have a vintage pocket watch or wristwatch in need of our expert repair or restoration services. Need Help Identifying Your Watch? We can't turn you into an instant antique watch expert, but we can share a little of our knowledge with you in order to help you learn more about your vintage or antique watch. We've provided answers to some of the more common questions you may have about your vintage watch in order to help you learn more about this fascinating area of American history. We Buy Antique Pocket Watches! We Buy Watch Tools & Watch Parts! We Buy Marine Chronometers & Atmos Clocks! We are always buying better-quality vintage and antique pocket watches. Whether you have a single watch or an entire collection to sell, we'll do our best to give you an honest assessment of your watch's condition and value, and we will pay best price for quality timepieces. You can be assured that your sale will be handled quickly, confidentially, and professionally. If you would like to discuss a potential sale, please call or email. 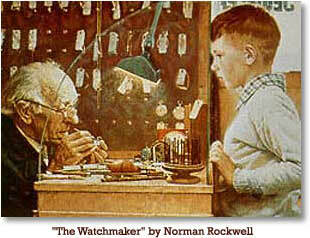 We promise prompt, knowledgeable service and immediate payment for your antique watch. We purchase most railroad-grade pocket watches and high-grade vintage wristwatches. We buy Hamilton, Howard, Illinois, Ball, Waltham, Elgin, South Bend, Omega, Patek, Rolex, Vacheron and other top brands. We're always looking for vintage watches with unusual dials, complications, chronographs, repeaters, moon-phase or up/down indicators. We pay top dollar for all marine chronometers and deck-watches. We will pay best prices for your vintage watches! Click to learn more. Contact us at any time to discuss your vintage watch repair needs, or the sale of your antique watch. Our Mailing Address Has Recently Changed! Please note: The address shown above is our mailing address only. For more information please refer to our Frequently Asked Questions Pages or the How To Section of this site. We are currently closed. Please call back during business hours. In the meantime, please browse our web site. Our Company Histories, Frequently Asked Questions, and How-To pages will help you to learn more about repairing, evaluating and collecting vintage watches. We respectfully request that you do not call or email to ask about the value of your vintage watch. We are unable to provide watch appraisals, values or historical information by phone or email.